For other places with the same name, see Florence (disambiguation). Florence  (Italian: Firenze) is the capital of the region of Tuscany in Italy, with a population of about 366,500. The city is considered a cultural, artistic and architectural gem. Florence was the birthplace of the Italian Renaissance. Politically, economically, and culturally it was the most important city in Europe for around 250 years; from some time before 1300 until the early 1500s. Florentines reinvented money in the form of the gold florin. This currency was the engine that drove Europe out of the "Dark Ages" a term invented by Petrarch, a Florentine whose family had been exiled to Arezzo. They financed the development of industry all over Europe, from Britain to Bruges, to Lyon, to Hungary. They financed the English kings during the Hundred Years War. They financed the papacy, including the construction of the papal palace in Avignon and the reconstruction of St. Peters and the Vatican when the papacy returned to Rome from the "Babylonian captivity". Dante, Petrarch, and Boccaccio pioneered the use of the vernacular, the use of a language other than Latin. In their case, Tuscan, which, because of them, became Italian. Because Dante, et al., wrote in Tuscan, Geoffrey Chaucer, who spent a lot of time in Northern Italy and who borrowed heavily from Boccaccio's little stories, wrote in English. Others started writing in French and Spanish. This was the beginning of the end of Latin as a common language throughout Europe. The Florentines, perhaps most notably Filippo Brunelleschi (1377-1466) and Leon Battista Alberti (1404-1472) invented both Renaissance and neoclassical architecture. These architectural styles revolutionised the way Rome, London, Paris and every other major city in Europe from Barcelona to St. Petersburg were built. Florentines were the driving force behind the Age of Discovery. Florentine bankers financed Henry the Navigator and the Portuguese explorers who pioneered the route around Africa to India and the Far East. It was a map drawn by the Florentine Paulo del Pozzo Toscanelli, a student of Brunelleschi, that Columbus used to sell his "enterprise" to the Spanish monarchs, and which he then used on his first voyage. Mercator's famous "Projection" is a refined version of Toscanelli's map, taking into account the Americas, of which the Florentine was obviously ignorant. The western hemisphere itself is named after a Florentine writer who claimed to be an explorer and mapmaker, Amerigo Vespucci. Gallileo and other scientists pioneered the study of optics, ballistics, astronomy, anatomy, and so on. Pico della Mirandola, Leonardo Bruni, Machiavelli, and many others laid the groundwork for our understanding of political science. Opera was invented in Florence. And that is just a smidgen of what went on in this city, which never had a population above 60,000 from the first attack of the plague in 1348 until long, long after it became unimportant. And there were the Medici, perhaps the most important family that ever lived. The Medicis changed the world more than any other family. Forget all the art for which they paid. They taught first the other Italians how to conduct state-craft, and then they taught the rest of the Europeans. Just to cite one example: Catherine de Medici (1519-1589), married Henry II of France (reigned 1547-1559). After he died, Catherine ruled France as regent for her young sons and was instrumental in turning France into Europe’s first nation-state. She brought the Renaissance into France, introducing everything from the chateaux of the Loire to the fork. She also was to 16th and 17th century European royalty what Queen Victoria was to the 19th and 20th centuries – everybody’s grandmamma. Her children included three kings of France, Francis II (ruled 1559-1560), Charles IX (ruled 1560-1574) and Henry III (ruled 1574-1589). Her children-in-law included a fourth king of France, Henry IV (ruled 1589-1610), plus Elizabeth of Hapsburg, Philip II of Spain (of Armada fame), and Mary Queen of Scots. And that is without mentioning any "artists". From Arnolfo and Cimabue to Giotto, Nanni di Banco, and Uccello; through Lorenzo Ghiberti, and Donatello and Massaccio and the various della Robbias; through Fra Angelico and Botticelli and Piero della Francesca, and on to Michelangelo and Leonardo, the Florentines dominated the visual arts like nobody before or since. And this list does not include many who, in any other place would be considered among the greatest of artists, but in Florence must be considered among the near-great: Benvenuto Cellini, Andrea del Sarto, Benozzo Gozzoli, Domenico Ghirlandaio, Fra Lippo Lippi, Buontalenti, Orcagna, Pollaiuolo, Filippino Lippi, Verrocchio, Bronzino, Desiderio da Settignano, Michelozzo, the Rossellis, the Sangallos, Pontormo, just to name a few. And this list does not include the prolific Ignoto. Nor does it include the near-Florentines, such as Raphael, Andrea Pisano, Giambologna, the wonderfully nicknamed Sodoma and so many more, such as Peter-Paul Rubens, all of whom spent time in Florence and were educated by it. In 1300, Pope Boniface VIII said that Aristotle was wrong, the universe was made out of five elements, not four: Earth, Air, Fire, Water, and Florentines. The cathedral topped by Brunelleschi's dome is the third largest Christian church and dominates the skyline. The Florentines decided to start building it in the 1200s. At the outset they were unsure how they were going to do it. It was "technology forcing", not unlike the American Kennedy Administration's decision to put a man on the moon. The dome was the largest ever built at the time, and the first major dome built in Europe since the two great domes of Roman times: the Pantheon in Rome and the Hagia Sophia in Constantinople. In front of it is the medieval Baptistery, where every Florentine was baptized until modern times. The two buildings incorporate the transition from the Middle Ages to the Renaissance in their decoration. In recent years, most of the important works of art from those two buildings and from the wonderful Bell Tower, designed by Giotto, have been removed and replaced by copies. The originals are now housed in the spectacular Museum of the Works of the Duomo, just to the east of the Cathedral. Florence is filled with many other churches stuffed with some of the finest art in the world: San Miniato al Monte, San Lorenzo, Santa Maria Novella, Santa Trinita, the Brancacci Chapel at Santa Maria della Carmine, Santa Croce, Santo Spirito, SS Annunziata, Ognissanti, and more. Then there are the art galleries. The Uffizi and the Pitti Palace are two of the most famous picture galleries in the world. But the heart and soul of Florence are in the two superb collections of sculpture, the Bargello and the Museum of the Works of the Duomo. They are filled with the brilliant, revolutionary creations of Donatello, Verrochio, Desiderio da Settignano, Michelangelo, and so many other masterpieces that create a body of work unique in the world. And, of course, there is the Accademia, with Michelangelo's David, perhaps the most well-known work of art anywhere, plus the superb, unfinished prisoners and slaves Michelangelo worked on for the tomb of Pope Julius II. In all, Florence has something over 80 museums. Among those at the top of most lists are the City hall, the Palazzo della Signoria (aka Palazzo Vecchio), a wonderful building with magnificent rooms and some great art; the Archeological Museum, the Museum of the History of Science, the Palazzo Davanzatti, the Stibbert Museum, St. Marks, the Medici Chapels, the Museum of the Works of Santa Croce, the Museum of the Cloister of Santa Maria Novella, the Zoological Museum ("La Specola"), the Bardini, and the Museo Horne. There is also a wonderful collection of works by the modern sculptor, Marino Marini, in a museum named after him. If you are interested in photography, you should not miss the superb collection of works by the early photographers, the Alinari brothers. The magnificent Strozzi Palace is the site of many special exhibits. To get a great overview of the city, you have plenty of choices: climb the dome of the Cathedral or Giotto's Bell Tower which is much easier or head for Piazzale Michelangelo a large parking lot on the hillside just south of the center of town, or climb a bit further to the church of San Miniato al Monte, a sublime 11th century masterpiece, with superb Renaissance sculptures. At vespers, the monks add to the beauty with chants. There are also a few places to buy things, from the high-end jewelry stores lining the Ponte Vecchio to some of the most famous shops in the world; Gucci, Pucci, Ferragamo, Valentino, Prada, Armani, Ermenegildo Zegna, Buccellati, Frette, as well as many more wonderful shops that aren't yet world famous. It is increasingly difficult to find bargains, but keen-eyed shoppers can still find good deals on smaller, side streets running off of those above and elsewhere in the center of town. The San Lorenzo market is now largely for tourists. There are also a couple of collections of "outlets" in the suburbs. 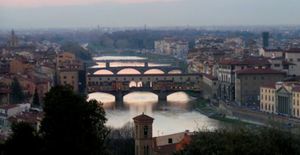 Great places to walk include along the Arno and across any of its bridges; through narrow, medieval back streets in the Santa Croce area; and in the Oltr'Arno - on the south side of the river, in many ways like Rome's Trastevere or Paris's Left Bank - but far, far smaller. There are also superb shopping streets, such as the Via Tornabuoni, the Via del Parione, and the Via Maggio. Florence has a mix of humid subtropical climate and mediterranean climate. Florence's tourist season peaks during the summer when the weather is hot (above 30°C or 86°F) and even nights don't usually get below 25°C (75°F). Heat waves do hit the city leading to 35°C+ (95°F+) temperatures occasionally and in rare cases up to 40°C (104°F). The record high is 42°C (108°F). The least amount of precipitation also falls during the summer. Winters are wet and chilly but not as cold as cities in the Po Valley. Lows usually hover between 0°C (32°F) and 5°C (42°F) and highs are around 10°C (50°F). Temperatures can drop below -5°C (23°F) when Italy is hit by a cold wave and, in rare cases, below -10°C (12°F). The record low is -23°C (-9°F). For those coming to the city seeking to see snow, keep in mind that while flurries occur every year accumulation isn't frequent and may not happen for an entire winter. Spring (and specifically May) is the best time to visit, even though nights can be chilly as late as April, and because it's drier than autumn. Florence is always buzzing with tourists, you will find them in large groups surrounding attractions such as the Duomo di Firenze, even in the worst weather. If you are looking to visit and experience warm weather, head to Florence in early April before it becomes too hot and humid in the city. The restaurants and cafes will open up their outdoor seating when the warm weather rolls in. If you're looking to escape the crowds, January and February deter some tourists due to the cold. Try to avoid traveling to Florence in August because of the smoldering heat. Many Italians flee the city to go on holiday and because of this, most popular shops are closed for the month. Florence's Amerigo Vespucci international airport (IATA: FLR) (known to locals as "Peretola")  has good connections to the center of the city, which can be reached in about fifteen minutes by taxi or bus. The Ataf-Sita "Vola in Bus" ("Fly by bus") service costs €6.00 one way, and makes the circuit between the airport and the central train station every half an hour from 5:30AM to 8PM, then once an hour afterwards. Tickets can be purchased directly on board from the driver at no extra charge (but keep in mind they only sell one-way tickets on board). The round trip tickets have to be purchased before getting on the bus, at the Busitalia SITA bus station off SMN or at ATAF&Li-nea resellers (most newsagents sell ATAF tickets as well as many coffee "bar" shops). Note that 5:30AM bus leaves from the corner of Valfonda and Piazza Adua which is north of the train station instead of from the ATAF-SITA bus station which is on the west side of the train station. You can buy the ticket on the bus. There is a €20 flat rate for taxis from the airport to any place in the historic center of Florence. They will charge €1 extra for each piece of luggage handled by the driver. Much cheaper flights to destinations throughout Europe can be found at Pisa airport (IATA: PSA). Low-cost airlines which fly to Pisa include Thomsonfly, Easyjet, Ryanair, Transavia, Wizzair and HLX. Pisa airport and Florence are connected by rail and by bus. Both leave from and arrive at the main entrance to the airport. The bus station in Florence is immediately across the street from the main railroad station, "Firenze SMN". Train schedules are available at http://www.trenitalia.it. The train costs €8.60. Some trains do not arrive at the main railroad station, and others require a change at Pisa Centrale. Modern, fast trains connect Florence with Italy's main cities, and local trains from other parts of Italy and express trains from around Europe arrive in Florence. The main station is Firenze Santa Maria Novella , on the edge of the historic old town. Other small stations are Firenze Campo Marte (near Florence Stadium) and Firenze Rifredi. If you take an Intercity train to Florence, you may need to change at Rifredi for another train to Firenze S.M.N. The transfer between stations via train is usually already covered by your train ticket (to check for this, your train ticket should not differentiate between the Florence train stations and will simply say "Firenze"). If you happen to have a long wait for the transferring train, it is also possible to take a bus to the city centre, but this is probably not covered by your train ticket. You might want to consider the overnight train connections to Florence from Paris or most German towns. For example, the train from Florence to Munich leaves at 21:53 and arrives in Munich the next morning at around 08:00. You can sleep comfortably the entire way and it costs about €100. However, recent reports indicate that overnight train service in much of Europe - including the service between Florence and Paris - has deteriorated badly in recent years, and prices have risen. It is now much cheaper, and, of course, much faster, but not as beautiful and nice, to fly EasyJet from Paris - Orly to Pisa and take the approximately 1 hour train or bus ride from the Pisa airport to the main railroad station, Firenze SMN, in central Florence. The train to Vienna takes ten hours and costs €70. Florence is connected by good highways to the rest of Italy. The easiest way to get in and out of the city from the A-1 Autostrada, which connects Florence to Bologna, Milan and the North, and to Rome and the South, is to use the "Firenze - Impruneta" exit. This is the same route for those leaving for or arriving from Siena on the "Fi-Si" highway. If you are arriving from or leaving for Pisa and the West on the A-11 Autostrada, it may be best to go by way of Firenze-Scandicci and use the A-1 to connect to and from the A-11. Driving in the historic center - inside the wide "viale" where the old city walls were (and still are, on the southern side of the Arno)- is strictly prohibited, except for residents with permits. Enforcement is by camera, and is ferociously efficient. If you drive in the prohibited areas, you will be tracked down, and you will receive stiff fines in the mail. Every 40 seconds, a motorist in Florence receives a traffic violation according to figures recently released by city officials. Traffic police issue approximately 90 tickets every minute, over 12,900 tickets a day. The fines on these tickets average out to about €140 per year, per motorist, and they bring about 52 million to city hall each year, making it one of Italy's most heavily fined cities. Local officials note that the amount of money that enters the municipal budget through traffic fines has tripled in the last 10 years. Of the traffic violations that issued by traffic police in 2008, around a 54% were issued to motorists who entered the limited traffic zones (ZTL) without the required permit; a 29% were given to drivers who parked in no-parking zones; a 2.6% were issued for speeding; and a 0,009% were given for having run a red light. Most fines comes from ZTL violations. There is a very strictly defined route to get in and out of the city for car rental agencies in the Via Fineguerra and the Borg'Ognissanti, just south of the Firenze SMN railroad station. If you rent there, be sure to ask at the office how to get in and out without violating the ZTL. Parking in garages and parking lots is expensive, costing €30 per night. There are three kinds of parking places on the street: white, yellow and blue. White is for residents only, yellow ones are reserved, so you can park only on the blue places. The price is €1 per hour and you have to pay from 8AM to 8PM (12 hours). Leave the ticket inside the car in a visible place. Attention: you need coins for the parking - the machine won't accept banknotes or cards. You can also find 'free' parking at all hours at "Piazzale Michelangelo" on the south side of the town. However, there are time limits for how long you can leave a car, which are rigidly enforced, and if you violate those limits, your car will be towed. It's about a 20 minute walk to the city centre (down the stairs and across the Arno). It has gorgeous views of the city as well. Bus stops have clear, schematic labelling of the routes and are all named according to the street name or major landmark nearby. They do not always give an indication of bus times, however, so it is sometimes difficult to figure out how long it may take till the next bus arrives. Tickets must be bought in advance from Tobacconists or newspaper sellers, and are usually valid for one hour over the whole network, so that you can just hop on and off at will. They cost €1.20 for 90 minutes, and multiple day tickets are also available. Tickets are also available on the bus, sold by the driver, at an increased price of €2 (therefore, no more excuses in case of ticket control). Better value is the €5 day ticket also from Tobacconists or news agents, best to add your name to the ticket and show your pass if needed by ticket control. Same as with cheaper. Tickets on first use need to be inserted into the ticket machine on the bus. The Firenze Card is a 72 hour pass for Florence allowing access to about 30 museums and free use of the public transport system. In some museums you can queue jump the reservations procedure with the pass but it is best to check with individual museums. The cost is €72 per person (as of April 2015). The Florence City Pass features free admission to the top sights and museums as well as guided tours. Furthermore, there are fast track entries to selected attractions such as the famous Uffizi and Accademia Gallery as well as further discounts. The Florence City Pass is available for 1 to 3 days (from € 59 to € 79) and an optional travelcard can be added. Most of the major tourist sights in Florence are within easy walking distance of each other. It is possible to walk from one end of the historic center of Florence to the other - North-South or East-West in a half hour. Walking is not only an easy way to get around, it also offers the chance to 'take in' much more of the city life. Be warned though, that electric motor scooters are small enough to fit where cars cannot. They are silent but quick and in the summer they often travel into the plazas. Some of the streets in central Florence are closed to traffic. Many more are simply too narrow for buses to get through. Therefore, bus and car tours are not recommended. This is a very small, very compact city that really needs to be seen by foot. And, of course, if you need to, you can always buy a new pair of shoes in Florence. There is a bike rental service organized by the city. Bikes can be hired at several points in the city (and returned to the same place). One of the most convenient for tourists is located at SMN station. There are other locations at many railway stations, but often with restricted opening hours. While there are hills north and south of the center of town, almost all of the historic center of Florence is easy for bikers, because it is as flat as a hat - flatter than that. But there is a problem: Traffic is terrible with buses, trucks, cars, motorcycles, motorbikes, bicycles, and pedestrians are fighting for almost no space. So pay attention. Beyond the city bikes, some of the hotels in town provide their guest with free bicycles. Bike shops also often rent bikes and some of them organize guided bike tours in the countryside. Italy Cruiser Bike Tours offers daily guided bike tours through Florence. In 3 hours you will see all the highlights of this beautiful city. BikeCityGuide is a handy bike navigation app for those who want to discover Florence on their own. The city of Florence can be downloaded for free and contains descriptions to all important sightseeing places and gives the opportunity to make special touristic tours. Type in any address or famous point of interest to be guided to it. Taxis are available, but it may be best if you have your hotel or the restaurant you are eating at call ahead. Taxis should be called by phone and the nearest one available is sent to you through the company's radio system with its meter ticking away. In Florence, it can be difficult to hail a cab from the street curb. You either call for one or get one at the very few taxi stands. One popular taxi stand is at the central Santa Maria Novella Train Station and in a few major squares. The first taxi in the taxi stand line should be free - ask in case of doubt. Be aware that most taxis do not take credit card for payment. Be sure to have cash and ask in advance in case you only have a credit card with you. Please note that taxis in Florence are relatively expensive. Tipping is not expected, unless the driver helps you carry luggage etc. Another way of getting around is by using the public buses from ATAF. A Single ticket costs €1.5 which is valid for 90 minutes. It could be bought at tabacchi (shops selling tobacco) or from ticket machines near major bus stops, including S.M.N train station. It could also be bought inside the bus, but it is advised to buy it in advance in a tabacchi so that you don't block the people getting into the bus at the door. You can also buy 10 tickets for €14. A day ticket costs €5 and a 3 day ticket costs €12. A four-ride ticket costs €4.50. To get the best price you may have to go to the central bus station. You can buy tickets at tabacchi (shops selling tobacco, which are marked with official looking "T"s out front"), kiosks/newsagents/bars where the symbol "Biglietti ATAF" is shown, as well as at the ATAF ticketing office at the bus station outside Santa Maria Novella train station. Remember to ask for a bus map. Several ticket options are available. One very convenient is the 4-rides ticket and the "Carta Agile". The former needs to be stamped when entering the bus (from the front and rear doors of buses - the central door is supposed to be exit only; though now it is more accepted to enter from the central door). The latter has an embedded electronic chip and needs to be held close ("swiped") to the upper part of the ticket machine inside the bus: the "beep" of the machine will inform you that a ticket has been paid and the display will show you how many more tickets ("swipes") you have left. Within 90 minutes of stamping/swiping you can hop-off & hop-on on any bus of the urban ATAF network. Unfortunately and completely against Italian law, it is not uncommon to see bus drivers talking merrily on their mobile phone while driving. Don't expect riders to complain about it and don't panic - they will still drive with the same non-comfortable style as when they are "only driving". Hold tight to hand rails as Florence traffic is unpredictable and frequent sudden braking is necessary. Bus rides are not by all means "smooth". Buses are "safe" but pick pocketing is quite common. Please keep a close eye to your belongings and avoid showing off cash/jewelry/etc. especially in very crowded buses (especially for lines 17/23/14/22 - generally speaking any crowded bus can give a chance to pick pocket). Do not put blind trust in routing provided by any major map service, as many bus routes have recently been rerouted (temporarily or permanently). Find a paper bus routes map or ask from the driver / fellow passengers. While on bus, keep on tracking travel progress, and if you see that the bus deviated off route, get off and walk to the next bus stop on the route. There is one tram line operating in the city of Florence. It connects Santa Maria Novella train station in central Florence with the southwestern suburb of Scandicci on a 7.4 kilometer route with a total of 14 stops. The tickets used on ATAF buses can also be used on the tram. Hours of operation: daily 500AM-1230AM. Frequency: 3-11 minutes depending on day and time of travel . Duration: about 23 minutes between Santa Maria Novella and Scandicci. This tram began service on 14 February 2010 and is the first streetcar line in the city of Florence since 1958. How to find the tram stop at Firenze Santa Maria Novella train station: As you have your back to the trains, take the door on the right. There should be a pharmacy right beside it - which also sells the combined ATAF 90 minute ticket, currently €1.20. Otherwise, there is also a machine at the stop outside, but it is easier to buy in the station. Driving inside the historic center of Florence is virtually impossible. Only residents with permits are allowed to drive there. Enforcement of the "Limited Traffic Zone" or "ZTL" is by camera. Violators will be tracked down and fined, but the fine may not arrive for a year or more after the infraction. The fines start at about €90. Once you enter the forbidden zone, it is virtually impossible to pass only one camera, and each time you do, it is a separate fine. In addition, Florence has some of the tiniest streets in Europe, an amazingly fiendish one-way system that confuses even the locals, and some streets that just come to an abrupt end, with little or no warning. Parking on the street in the historic center is out of the question. It may only be done by residents with a permit, and all other cars are towed away instantly - if not sooner - to some godforsaken suburb from which it will cost you hundreds of euros to get yours returned. That said, you may be able to arrange a very temporary - about 30-minute - exemption through your hotel, which will need your license number and other information to make arrangements with the authorities. You will then have to get the car from the hotel out of the ZTL before the exemption expires. A car can be useful to reach some destinations just outside the city centre, like Fiesole or Settignano (these sights are also reachable by bus service), or for day trips to wonderful places such as Siena, Volterra, Arezzo, etc. It is possible, if a bit tricky to rent a car in Florence and get out of town and back to the car rental agency without violating the ZTL. Those tempted to do so, should make sure to get precise directions from the rental agency. The Uffizi is the most famous, but Florence also has other amazing museums a short walk away with world class artistic treasures. Note that the first Sunday of the Month all state museums, meaning all the main museums, have free entrance. It is best to book ahead at the ticket counters as it can be busy. Galleria degli Uffizi, Piazzale degli Uffizi, ☎ +39 055 294883, . Tu-Su 8:15AM-6:50PM. One of the world's most famous fine art museums with collections of Renaissance paintings and sculptures from classical antiquity. Included is The Birth of Venus and Primavera by Sandro Boticelli, as well as Titian's Venus of Urbino. There are often long lines and several hours' wait is common, starting even before the doors open. You can call +39 055 294883 to make a reservation in advance and walk right in. The phone operator will give you an extension number which you quote at Gate 3 to pay (cash only) and get the tickets. Alternatively, there is a ticket office at the museum which will normally sell these same reservation tickets for almost immediate entry. Online booking is available but is much less convenient because it costs more, has a 24 hour waiting period, your specified time may change and you need to print an email. The restaurant/caffè has a large balcony overlooking the main piazza with good views of the Palazzo Vecchio. It is a great place to take a break for art lovers making a non-rushed visit to this fantastic collection. This cafe is rather expensive however. Street performers are often seen outside the Uffizi. 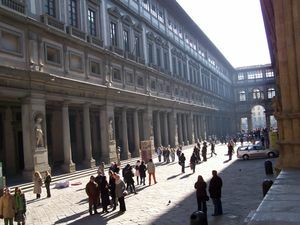 Admission €20.00 (as of May 2018), phone booking €4 extra; Online booking [http://www.b-ticket.com/b-ticket/uffizi/default.aspx] €4 extra. edit Booking in person is 4€ extra. For those making longer stays in Florence, the city also has an interesting archaeological museum (the Etruscan art collection is particularly good), a Contemporary Art gallery, seated in Palazzo Strozzi, and other collections. Santa Maria del Fiore , also known as the Duomo di Firenze is the city's beautiful cathedral, the symbol of the city. Brunelleschi's huge dome was an engineering feat of the rennaissance. A statue of Brunelleschi is sited in the piazza, with his figure looking upwards towards his dome. The cathedral itself is free to enter and there is a combo ticket for the Dome, Campanile, Opera del Duomo museum, Baptistery and archaeological excavation under the cathedral, which costs €18 and allows a visit to each of the sights. When you buy the ticket (or when you actually make it to any of the local ticket offices), you can choose a time to visit the Dome (every half an hour). If your appointment time is e.g. 16:30, come ~ 16:20, walk to the head of the line, find those whose time is 17:00 and stand in front of them. Appointment times will be checked by an attendant against the barcode on the ticket, and if you came untimely, you will not be admitted. The Dome (entrance on the side of the church) has 464 steps curving at the top of the dome. Giotto's Tower- adjacent to the Duomo, you can climb the tower for a magnificent 360-degree view of the Duomo, Florence, and the surrounding area, and requires some tenacity to climb 414 steps. Included in Intero ticket (see Duomo). Baptistery famous for bronze doors by Andrea Pisano (14th century) and Lorenzo Ghiberti (15th century) and a beautiful interior the vault of which is decorated with 13th century mosaics (the only medieval set of mosaics in the city. Included in Intero ticket (see Duomo). Palazzo Vecchio - old city palace/city hall, adorned with fine art. The replica of Michelangelo's "David" is placed outside the main door in the original location of the statue, which is a symbol of the Comune of Florence. The site displays an important collection of Renaissance sculptures and paintings, including the Putto, by Verrochio, and the series of murals by Giorgio Vasari at the Salone dei Cinquecento (Hall of the Five Houndreds) - the hall which used to display the now lost Renaissance masterpiece, that is, the so-called Battaglia di Anghiari, by Leonardo da Vinci. Mercato del Porcellino On your way to the Ponte Vecchio, you will encounter to your right, a market (Loggia del Mercato Nuovo) which hosts this peculiar boar made of bronze. Legend has it that your wish will be granted (or you'll one day return to Firenze, or receive fortune and good luck, amongst others) if you rub its polished snout while placing a coin in its mouth which must slide and fall into the underlying grating. Your best chance for a photo will be at night when the market closes and the vendors have completely cleared the market area; otherwise, you'll photos will have merchandise and tourists as background. While at this market, do peruse through the vendors and look down at the floor for a large marble circle which is known as the "Stone of Shame" as it was the place where insolvent merchants were publicly shamed before heading to prison or exile. Ponte Vecchio the oldest and most famous bridge over the Arno; the only Florentine bridge to survive WW2. 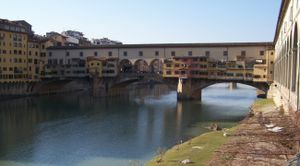 The Ponte Vecchio (literally "old bridge") is lined with shops, traditionally mostly jewellers since the days of the Medici. Vasari's elevated walkway crosses the Arno over the Ponte Vecchio, connecting the Uffizi to the old Medici palace. Santa Croce church contains the monumental tombs of Galileo, Michelangelo, Machiavelli, Dante, and many other notables in addition to artistic decorations. There is also great artwork in the church. And when you're done seeing that, a separate charge will gain you admission to the Museo dell'Opera di Santa Croce, where you can see a flood-damaged but still beautiful Crucifix by Cimabue (Giotto's teacher), which has become both the symbol of the flooding of Firenze in 1966 and of its recovery from that disaster. The Pazzi Chapel, a perfectly symmetrical example of sublime neo-Classic Renaissance architecture is also worth visiting. Santa Maria Novella, near the train station, is a beautiful church and contains great artwork, including a recently restored Trinity by Masaccio. Also, the Chiostro Verde, to your left when facing the front entrance of the church, contains frescoes by Paolo Uccello which are quite unusual in style and well worth seeing, if the separate entrance is open. Off of the church's cloister is the wonderful Spanish Chapel which is covered in early Renaissance frescoes. San Lorenzo the facade of this church was never completed, giving it a striking, rustic appearance. Inside the church is pure Renaissance neo-classical splendor. If you go around the back of the church, there is a separate entrance to the Medici chapels. Be sure to check out the stunning burial chapel of the princes and the sacristy down the corridor. The small sacristy is blessed with the presence of nine Michelangelo sculptures. San Marco Convent (1436) houses frescoes by Fra Angelico and his workshop. Fra Angelico painted a series of frescoes for the cells in which the Dominican monks lived. Piazza Signoria: Home to the “Fake David”, Piazza Signoria is definitely a sight to see. Shops and cafes surround the plaza, but what makes Piazza Signoria special is the abundance of statues within the plaza. The statues represent antique renaissance art including a copy of Michaelangelo’s David. In this square you can also visit the Florence Town Hall, also known as, Palazzo Vecchio. This Romanesque Fortress is one of most significant public places in Italy. In front of the Palazzo Vecchio is a plaque marking the site of the execution of Fra Girolamo Savonarola, who ruled Florence with a theological iron fist until his excommunication and condemnation by the Vatican. Boboli Gardens, elaborately landscaped and with many interesting sculptures, behind the Pitti Palace. Wonderful city views. Don't miss the Bardini gardens. Entrance to that is included in the combination ticket price for the Boboli, and it's a short walk from the Boboli Gardens. There are great views of the Duomo from the Bardini gardens. A single adult ticket to the gardens costs €13. Santa Maria del Carmine has famous frescoes (Masaccio’s Adam and Eve Banished From the Garden and others by Lippi and Masolino) in the Brancacci Chapel. Piazzale Michelangelo (Michelangelo square) plaza on a hilltop with a great view of the city (go there by bus) or climb the stairs and paths from the Lungarno della Zecca. San Miniato al Monte, uphill from Piazzale Michelangelo. The Sacristy contains frescoes by Spinello Aretino. In the cemetery near this church there are graves of famous people of Florence, including Carlo Lorenzi (Collodi) - author of the famous Pinocchio. Santa Felicita, on the Oltrarno, or south side of the Ponte Vecchio, contains frescoes of the Annunciation and a painting of the Deposition of Christ by the brilliant and weird mannerist painter, Pontormo. They are to be found in the Barbadori Chapel, which is to your immediate right when entering the church. Fiesole-see Florence from above, If you would like to see Florence from "above" then you should take a local bus (Bus 7) to Fiesole. This is a hill just 15-20 minutes outside the center to the east where you have a fantastic view of the total city. A perfect spot for a lunch or the sunset. Some restaurants are open the full day - and other regular siesta from 3-6 in the afternoon.Try pizza! Liberal Academy of Fine Arts. Offers academic courses of 3 plus 2 years (restructured duration) for diplomas at 1st and 2nd level (equivalent to the short degree and specialization degree) in five subjects: Photography, Graphic Design and Multimedia, Design, Painting and Restoration. Florence Photography Club. If you are interested in Florence and photography this group teaches photographic techniques. Anyone can learn to improve their photographic skills. Everyone is welcome, from complete beginner to professionals. The Florence Art Studio. A working studio that offers intensive custom programs in drawing or painting from life in Florence, Italy. The Florence Art Studio is completely different from the other ateliers in Florence in that they offer private instruction in the Studio setting, tailored to meet the needs and time constraints of each student. Courses begin on a rolling schedule, and can last anywhere from as little as a week to as long as three months or more. Istituto il David. School of Italian Language, located in the city center of Florence. Offers different varieties of courses. Also offers adjacent courses such as Italian Cuisine, Italian Winery, etc. Accommodation can be arranged as well either with families, or in apartments. Souvenirs related to art and Florence's sights can be found everywhere. Shops that are not located in the very centre of the city are significantly cheaper. Books, leather goods, art handcrafted journals, frames, pencils etc. in that gorgeous Florentine paper with swirls of color and gold. Better stores in/near the city center offer superb leathers at sometimes decent prices...perhaps after some bickering. Goldsmiths on the Ponte Vecchio display beautiful and quality work, but can be very expensive. Some of the most uniquely Florentine shops and sights can be found in the Oltrarno, which is Florence's "left bank" and home to countless generations of artisans. This section of town can be found by crossing "Ponte Vecchio" (the old bridge) or Ponte Trinità from the center. This "undiscovered" Florence is a must-see. Beware: If the police catch you while buying a knock-off version of something with a brand from an (illegal) street vendor, you can be fined up to €10,000. You'll see plenty of people on the street selling imitation Gucci sunglasses, Rolex watches, and Prada purses dirt cheap. It's okay if the item doesn't have a real brand on it, but buying a knock-off is illegal. Remember that restaurants have separate prices for food to go or eaten standing up versus sit down service; don't try to sit at a table after paying for food or coffee from the restaurant's to go booth. Also ask always beforehand for the price if you want to sit at a table. Otherwise you might be uncomfortably surprised. Cappuccino al banco i.e. standing up might cost €1-3; but at a table €4. Florence's food can be as much of a treat to the palate as the art is a treat to the eye. There is good food for any price range, from fine restaurants to take out food from window stands. The best price/quality ratio you will find outside the historical center where normal Italians go to eat. The worst ratio is probably in the neighbourhood of Mercato di San Lorenzo where there are a lot of tourist restaurants, while many of the best restaurants in the city are found in the Santa Croce district. In some, requests for pizza may be met with a rebuff. For local pizza look for small shops near the Duomo. The best lunch places don't always turn out to be the best dinner places. Dinner in Florence really starts sometime between 7PM and 9PM. If a place looks like they're preparing to close before 8PM, it might not be the best option for dinner. Reheated pasta is not very tasty. Typical Tuscan courses include Bistecca alla fiorentina which is huge t-bone steak weighing from 500g to 1,500g. It has always price given per 100g, e.g. €3.5 etto (an etto is a "hectogram" or 100 grams-ettogrammo). Crostini toscani are crostini with tuscan liver paté. There is also a uniquely Florentine fast food with a 1,000-year history - lampredotto, a kind of tripe (cow stomach, or calf for preference, but a different part than the more familiar white "honeycomb" kind, dark brown in color; the name comes from its wrinkled appearance, which apparently reminds locals of a lamprey fish). The trippaio set their carts in the public squares in the center, dishing out the delicacy straight from the cauldron in which it is being boiled with herbs and tomatoes, chopping it and slapping the portions between halves of a Tuscan roll; the top is dipped in the broth. A mild green parsley- or basil-based sauce or a hot red one goes with it. For an authentic tuscan experience, try dining with local chefs at their own homes. Learn true Italian cooking from the locals themselves, eat great food, enjoy the company of new friends and see a different side of the city. BonAppetour is a great site to discover unique dining experiences in Florence. There are many gelato (Italian ice cream) stands; some connoisseurs consider the better Florentine gelato the finest in the world. Often gelato is made in the bar where you buy it. Because of this there are many exotic flavors of ice cream like watermelon, spumante or garlic. It's hard to find a gelato place open very late, so after dinner might not be an option. Near the Duomo though, there are a few places open after 10PM. Tuscany is also the wellspring of cantuccini, also called biscotti di Prato. (Please note that in Italian, the singular of biscotti is un biscotto). It's traditional to enjoy them after a meal by dipping them in Vin Santo ("Holy Wine"), a concentrated wine made from late-harvested grapes, but you can also buy bags of them in stores throughout the city and eat them however you like. There are numerous caffè and pasticcerie where you can find excellent sandwiches. Pizza sold by weight is an equally excellent solution for budget dining (vegetarian and vegan options are almost always available), as is any caffè displaying a "Primi" card in its window where you'll find pastas and other dishes at low reasonable prices. The delis (rosticcerie) are very affordable (and the food is often quite good), and some also have dining tables if you don't want to take away. You can buy the makings for a picnic or snack at the Mercato Centrale. This large market has everything you might need, often at more affordable prices than supermarkets. The stalls will also sometimes vacuum seal whatever you buy so you can take it home with you. To save some money instead of buying breakfast and lunch at a restaurant or shoppe, visit the local supermercatos. There you can buy breakfast, lunch, snacks, and beverages all under 20 euros and can feed many. The supermercatos are equipped with alcoholic beverages, as well; so save yourself some money at the bar by buying a bottle of wine for under 5 euro! A general rule: the closer you are to the historic old town, the higher the price. Il Vegetariano, Via delle Ruote, 30 r. . ☎ +39 055 475030. A welcoming budget restaurant that serves delicious and healthy food to a nice mix of locals and tourists. One can sit in the more formal front room, the eclectic middle room, or the peaceful outdoor garden in the back. Daily changing menu with vegan and gluten-free items clearly marked, many luscious desserts on display, salads, soups, hearty brown bread, and a good selection of coffee, tea, wine, beer, and liqueur. Oil Shoppe, Via S. Egidio 22r, . This quaint deli has affordable (€4) hot and cold sandwiches made with a variety of meats (try the meatball sandwich), sauces and fresh vegetables. You can get a meal deal with chips and small drink for €6.50. It is open from 10.30AM to whenever the bread (white, wheat and sub rolls) runs out, which is usually between 6 and 7 in the evening. During the peak period of February to June, it can get very crowded in the day with students, but their love for the sandwiches there is apparent in their loyalty. A good mid-day meal to take with you on the go as you explore Florence, Via S. Egidio is not too far off the beaten track. The Oil Shoppe also sells its own extra virgin olive oil, which they generously use in their sandwiches. Trattoria Mario, Via Rosina 2/R (near Piazza Mercato Centrale); ☎ +39 055 218550 (no bookings) The restaurant opens for lunch and they sit you with other people walking into the restaurant. There is a menu on the wall and the food is great and if you can, save room for a secondi (meat plate). al Tranvai, Piazza T.Tasso, 14 r. ☎ +39 055 225197 . An excellent restaurant for authentic Tuscan fare away from the tourist centre. This place gets very busy around 8PM with the locals so be there a bit before. Very traditional Tuscan food at decent prices. 1st courses at €7 and 2nds at about €10 to €16. Vino at €4/0.5L. The rabbit, asparagus souffle and fiori fritti are excellent and the service very welcoming and warm. "Il Latini" Restaurant, Via dei Palchetti, 6r. ☎ +39 055 210916. You actually are seated at a table with other people and that is the fun of the restaurant. The owner visits each table and everyone is in a great mood. It is the combination of all that is mentioned above plus the personalities of the waiters make it a fun place to eat, visit and enjoy the whole Florentine experience. At 7:30PM when it opens, you will see a crowd outside the restaurant trying to be first in line. The restaurant is bigger than it looks. Even if you do wait, they bring you wine and cheese to those in line. The line is worth it. You might try and ask the owner if you could see the cellar because that is where there is a small private dining area for wine lovers (group party) and the wine is stored there. Restaurant Terrazza Brunelleschi Piazza Unità Italiana, 6. ☎+39 055 235 80 (fax +39 055 235 888 95). . From the Panoramic "Terrazza Brunelleschi" Restaurant you can catch all of Florence in a glimpse: the dome of Santa Maria del Fiore designed by Brunelleschi and Giotto's famous campanile, the roofs of the age-old buildings of the historical center and the green hills that surround the city on the horizon. Enoteca Pinchiorri Via Ghibellina, 87. ☎ +39 055 242777 . Situated in the center, near Santa Croce, perhaps the most expensive and exclusive winery and restaurant in Florence. You will choose from a selection of the best Italian wines. Expect to spend more than €100 each, but according to your wine taste, it can easily reach much higher prices. You will be presented with separate bills for the food and for the wine. Il Cibreo Via Dei Macci, 118/R. ☎ +39 055 234 11 00 (fax +39 055 244 966). In the center near Santa Croce. Vast and great choice of Tuscan food, with highly selected ingredients. €50-100 each. Filipepe Via San Niccolo 39/R. ☎ +39 055 2001397 . Settled in the quarter of San Niccolo, under the hill that hosts the famous Piazzale Michelangelo, Filipepe is a fish and seafood restaurant offering oysters, lobsters, shellfish and fruits de mer. Wide range of sparkling wines. Perché No Via dei Tavolini 19. Freshly made daily from quality ingredients. The pear will be made with real pears and will taste of pears. Typically fruit flavors will be made with seasonally available fruits. Chocolate flavor will taste of cocoa rather than chocolate milk-powder. If you are a chocolate fan, this is the place to go. Specialties are "sorbetto" (ice cream made with water rather than milk, both with fruit and standard flavors, and "mousse" ice creams. Ask for the "special" taste of the day. Vivoli, Via Isole delle Stinche, 7/R. ☎ +39 055 292 334. Close to Piazza Santa Croce. Vivoli has a good gelato fruit selection, so definitely try the fragola, or strawberry. Make sure that you ask for the cream on top as well, because it adds another element to an already great dessert. Tap water is safe but those who prefer bottled water will find it plentiful. Make sure to sample the excellent wines of the region. Chianti is the local wine that can be ordered cheaply. Many eateries will offer carafes of various sizes of "house chianti", usually for under €4. La Cite  A very nice and cozy cafe/bookstore. Good prices, nice atmosphere, good books. Borgo San Frediano 20r. Uffizi Museum The bar at this museum offers an amazing view overlooking la Piazza della Signoria, but it's only accessible through the museum, so you'll have to buy a ticket. Irish Pub (The Fiddlers Elbow) Piazza Santa Maria Novella. This pub has plenty of seating, in addition to live music and great staff. Bebop-great coverbands everynight and a €4 pint. Can be found north of the Duomo on the right on Via Dei Servi, before you reach Piazza d Annunziata. Ambrosia - Found in Piazza de Ambrosia. This is primarily a wine bar, and you can sample some great wines at a low cost provided you come with friends and share the price of whole bottles. Rivoire Piazza della Signoria. Founded in 1872 this terrace facing the Palazzo Vecchio is a Florentine institution. Paszkowski or Gilli. Situated on the Piazza Republica, next to the hotel Savoy. Note that the terraces on the other side of the piazza are equally pricey. As elsewhere the price of hotels in Florence has been climbing quickly in the last few years. The golden rule here is if you want something cheap you'll have to stay outside of the historic center. The area around the train station is cheaper, but not as safe, especially for women travelers at night. If you are looking at big chain hotels you should be aware that they are usually quite a distance from the centre, the Novotel for instance is almost at the airport. Certain hotels, particularly those oriented toward business travellers offer special reduced rates during the weekend (eg. Starhotel Michelangelo) or during slow weeks like Baglioni. Sometimes you can also get a substantial discount by reserving online. In the train station there is a tourist information office which also offers hotel reservations; you can often get good deals through them at the very last minute, but it's not guaranteed. There are quite a number of one or 2 star alberghi within a short distance of the station. Young women can findItemid=43 accommodation with certain convents at very low prices, and usually in historic locations, but you'll have to forget about any late-night Tuscan craziness. Camping Michelangelo has a scenic location on the hillside close to Piazza Michelangelo. Usually it is very crowded. It has "house tents" available, which are tents for two people with bunk beds inside. Sanctuary B&B Firenze – Borgo Pinti, 15. Tel. +39 55 2480582 Safe, convent accommodations in a historic palazzo in the center of Florence. Single, twin, triple and quadruple beds, A/C. Large courtyard garden, peaceful. Rates from €55. New H-Ostel Florence- Via Iacopo Peri,3. Tel/fax.+39 055 5272220 . Ciao Hostel Florence – Via Guido Monaco, 34. Tel. +39 055 321018 • Fax +39 055 321652. The Ciao accommodation is a modern hostel of Florence close the to Santa Maria train station with fifteen bedrooms of different size divided in dormitory, double, triple and quadruple with shared bath. Services available are free internet, satellite TV, kitchen, towel, air conditioning and garden. Rates start from €27. Hostel Archi Rossi - Via Faenza, 94r. ☎ +39 55 290804 (fax +39 55 2302601) - Never mind the renaissance-kitsch walls. This hostel is close to the Santa Maria Novella train station. Rooms are clean and rates include breakfast, dinner (except Saturdays) and internet access. The hostel offers a free walking tour daily starting at 10AM. An English speaking guide rotates between the classical and off-the-beaten-path walking tours around the city. Rates from €18 (dorm) and €26 (private room/per person). B&B Duomo View Florence – Piazza San Giovanni, 6 . Telephone +39 055 288290 • Fax +39 055 288290. The Duomo View is a bed and breakfast of the historic centre of Florence with a large choice of double bedrooms. Services are in common and some of the guestrooms boast a fantastic view on the Florentine Duomo. Internet connection and breakfast also available. Rates from €50. Locanda della Musica Florence – Via Faenza 85, 50123 Florence, Italy  • Telephone +39 055 264251 • Fax +39 055 2647780. Bed and Breakfast next to the train station of Santa Maria Novella. Single, double and triple bedrooms with external or internal bathroom. The others services include shower, TV, Wi-Fi and breakfast included in the communal kitchen. Double rooms: 75 Euros. Anna's Hotel Florence – Via Faenza 56, 50123 Florence, Italy  • Telephone +39 055 2302714 • Fax +39 055 2647780. Single, double and triple rooms with private bath, shower, satellite TV, free Wi-Fi and breakfast included. Double rooms: 90 Euros. Croce di Malta Hotel Florence - Via della Scala, 7 – Florence 50123, Italy  Telepone + 39 055 261870 • Fax +39 055 287121. Ninety-eight bedrooms with private rooms (some with two), en-suite services, shower, air conditioning, satellite flat-screen TV and free Wi-Fi. Also available: restaurant, three meeting rooms, panoramic terrace, swimming pool and piano bar. Double bedroom 100 Euros, breakfast included. Executive Hotel Florence – Via Curtatone, 5, 50123 Florence, Italy. • Telephone +39 055 217451 • +39 055 268346. Constructed in the 18th century the Executive Hotel offers classic, deluxe rooms and suite apartments in the central of Florence, with private bath, satellite TV, free Wi-Fi and breakfast included. Double rooms: Euros 100. The Gate Hotel Florence – Service Area Firenze Nord - Highway junction A1-A11 - 50019 Sesto Fiorentino, Italy  Telephone +39 055 4698100 • +39 055 4698111. The Gate Hotel is four star accommodations with twin, double bedrooms and junior suites with private bath, shower, free internet connection and LCD TV. 60 Euros for a double room with breakfast included. Hotel Delle Tele Via Panzani, 10. ☎ +39 055 238 2419, (fax +39 055 290 797) . In the old town centre of Florence, between Santa Maria Novella railway station and the Cathedral. Rooms from €55. Hotel Derby Via Nazionale 35. ☎ +39 055 2193308, (fax +39 055 285839), PIVA 05265000488, . Small family run hotel located on the 5 floor of a 6 floor building. All the rooms contain private facilities and the location is convenient to the train station. Doubles starting from €60. Hotel Europa Signa – Piazza Stazione, 10 - 50058 Signa, Florence, Italy  Telephone +39 055 8734345 • Fax +39 055 8734041. The Europa Hotel is a modern three star accommodation with 116 bedrooms, meeting rooms, restaurant and bar. Perfect also for wedding receptions. All the rooms come with private bath, shower, satellite TV, internet connection, air conditioning and telephone. Double room with breakfast included: 58 Euros. Hotel Fiorita, Via Fiume, 20. ☎ +39 055 283189, +39 055 283693, +39 055 2654376, (fax +39 055 2728153). (Toll free number within Italy ☎ 800 280722). Elegant building and surroundings in the center of Florence. Rooms have air conditioning, a minibar, direct telephone line, satellite TV and a safety deposit box. Some rooms also have modem sockets. Singles starting from €65. Hotel Genzianella Florence – Via Cavour 112 - 50129 Florence, Italy  Telephone + 39 055 572141 • Fax + 39 055 573909. The Genzianella is a cheap two star hotel located near the historic centre of Florence. 13 bedrooms with private bath, shower, internet Wi-Fi, LCD TV and air conditioning. Double rooms: 50 Euros with included breakfast. Hotel Kursaal & Ausonia Via Nazionale, 24. ☎ +39 055 496 547 (fax: +39 055 462 6615) . A small boutique hotel that offers traditional-styled rooms and family-run hospitality in the heart of Florence's historical centre, midway between the Duomo and Florence's central train station. Double rooms starting from €50. Hotel Lorena Florence – Via Faenza 1. Cap. . ☎ +39 055 282785, (fax +39 055 288300). The Lorena is a two star hotel located in the historic centre, with single, double, triple and quadruple rooms. Some with shared bathroom. The breakfast is optional. From €25 for a single with shared facilities, to €75 for a quadruple with private bath. Hotel Romagna Florence – Via Panzani, 4 . Telephone +39 055 211005 • Fax +39 055 2396105. The Romagna is a cosy and economic two star hotel of Florence located next to the Santa Maria Novella train station. 22 bedrooms with private bath, internet connection and satellite TV. Double rooms: €89 with breakfast included. Nuova Italia Hotel Florence – Via Faenza, 26 - Cap: 50123, Florence, Italy. . Telephone +39 055 287508 • Fax +39 055 210941. The Nuova Italia is a two star hotel located between the Exhibition Centre of Fortezza da Basso and the Duomo of Florence, offering 20 bedrooms with private en-suite facilities, tourist information service, free breakfast, room service and convenient rates. Rates: Single €47-€135; Double €47-€211. Hotel Basilea Florence Via Guelfa 41- Cap. ☎ +39 055 214587 (fax +39 055 268350). The 3 star Hotel Basilea offers 38 bedrooms, single, double, twin, triple and 2 large suites. All with private bath, television and internet connection. €85 for a double, and €65 for a single. Hotel Boston Florence – Via Guelfa, 68. Cap. ☎ +39 055 496747 (fax +39 055 470934). 3 star hotel with 16 bedrooms divided in singles and doubles. Some with private en-suites, others with shared bathroom. Rates starting from €50 for a single without private bath, and €135 for a double. Hotel De Rose Palace, Via Solferino, 5. ☎ +39 055 239 6818 (fax +39 055 268 249). 4 star hotel housed in a traditional Florentine mansion a short walk from Ponte Vecchio and Santa Maria Novella central train station. Prices starting from €100 for a double room. Galileo Hotel, Via Nazionale, 22/a. ☎ +39 055 496645 (fax +39 055 496447) . An elegant 19th century building furnished with style in the best of Tuscan tradition, in the heart of Florence. Single rooms from €80, doubles €120, superiors €150. Hotel Crocini, Corso Italia 28. ☎ +39 055 212905 (fax +39 055 210171) . In the center of Florence. Average prices: twin (without private bathroom) €40, triple (without private bathroom) €50, single (with private bathroom) €40, twin (with private bathroom) €50, triple (with private bathroom) €60. Hotel La Residenza, Via Tornabuoni, 8. ☎ +39 055 2340650 (fax +39 055 240863), . High quality facilities. Roof garden with a charming view. Single from €78, double from €110, triple from €145. Hotel Malaspina, Piazza Indipendenza, 24. ☎ +39 055 489869, (fax +39 055 474809), . Charming late 19th century residence, enriched with modern comforts. Close to Fortezza da Basso (5 min walk), the most important trade show center of the city, Palazzo dei Congressi and Palazzo degli Affari. Single €90, double €110. Hotel MarignolleVia di San Quirichino a Marignolle 16. ☎ +39 055 2286910, (fax +39 055 2047396), . The relais is surrounded by the typical scenery of the Florentine hills, with cypresses and cane-apple trees, broom bushes and pine trees, amongst the scents of lavender, rosemary, time and catmint. A pool with a large solarium, deck chairs and sunning beds, is at guests’ disposal from May to October. Double rooms from €165. Hotel Mario's, Via Faenza 89. ☎ +39 055 216801, (fax +39 055 212039) . Near Santa Maria Novella. Single €67, double €82. Hotel Mia Cara, Via Faenza, 90 (red). ☎ +39 055 216053, (fax +39 055 2302727), . Small hotel a short walk from Santa Maria Novella. Friendly English-speaking staff. Continental breakfast included. Single from €35, double from €50, triple from €75, quadruple from €80. Fiorino Hotel Florence – Via Osteria Del Guanto, 6 - Cap: 50122, Florence, Italy. . Telephone +39 055 210579 • Fax +39 055 268929. The Fiorino is a three star hotel which boasts an excellent location truly a few hundred meters away from Ponte Vecchio and Uffizi Gallery. Even if hosted in a medieval palace, in the 23 bedrooms of this three star accommodation one can find also modern services and facilities as the internet connection and the satellite TV. Inside Florence Hotel – Vicolo degli Adimari, 2 | 50122 Firenze, Italy  Telephone +39 +39 055 216086 • Fax +39 055 216086. Group of three star hotels of Florence with private bath, breakfast included and shower. Double rooms starting from 100 Euros. Villa il Mosaico Florence – Via Monticelli, 9-15 . Telephone +39 055 7135481 • Fax +39 055 71 30 898. The Villa il Mosaico is hosted in an historic and elegant villa located 20 minutes away from the historic centre of Florence. Ten self-catering apartments with kitchen, living room, bathroom, internet connection and TV. Private parking and 100 square metre terrace with solarium. Suite deluxe €169. Palazzo Magnani Feroni Borgo San Frediano, 5. ☎ +39 055 23.99.544 (fax +39 055 055 26 08 908). . Luxury suites Florence within a period residence in historic palace of the '500 in San Frediano, the oldest neighborhood in Florence. This luxury accommodation also provides expertise of a trained staff and an exclusive setting for business meetings with services worthy of the best 5 star hotel. Grand Hotel Cavour, Via del Proconsolo, 3. ☎ +39 055 266271, (fax +39 055 218955) . Occupies the medieval 13th century residence of the noble Strozzi-Ridolfi families - powerful Florentine families whose history is intertwined with that of the legendary Medici dynasty as well as the Republic of Florence itself. €150-300. Hotel Mirage , Via Francesco Baracca, 231 (interno 18). ☎ +39 055 352011, (fax +39 055 374096), . An elegant, exclusive and comfortable 4 star hotel 5.6 km from Piazza Duomo and less than 500 m from the Florence airport (FLR). Single from €110, doubles from €140, triples from €160, apartments from €300 per week. Hotel Monna Lisa Florence,,Borgo Pinti, 27. . A hotel in a restored 14th century Florentine noble palace. Gym facilities, sun terrace and meeting rooms. €200-550. Residence La Repubblica Florence – Piazza della Repubblica, 4 . ☎ +39 055 214496, (afx +39 055 214496). 21 self catering apartments for a maximum of six people. All with kitchenette, private bath, internet connection, satellite TV and cooking facilities. One person apartment €160 three/two bedroom apartment €170. The J and J Historic House Hotel Florence. Via di Mezzo, 20. . ☎ +39 055 26312 (fax +39 055 240282). 4 star hotel with double, twin, junior suite, suite, and double rooms for single use. The twin and double rooms are also available as classic and deluxe. All come with en-suite services. Breakfast is included. Single €195, double €225. Villa la Vedetta Relais & Chateau, Viale Michelangiolo 78. ☎ +39 055 681631 (fax +39 055 6582544). 5 star luxury hotel features a view of Florence's skyline. Rooms from €299. Hotel degli Orafi Lungarno Archibusieri, 4 | 50121 Firenze (Italia), ☎ +39 055 26622 ([email protected], fax: +39 055 2662111), . Hotel degli Orafi is a 4 star hotel located on the river bank Archibusieri near the Ponte Vecchio, the Uffizi Gallery and Piazza della Signoria. The rooms, divided into Classic, Executive and Junior Suites, spacious and elegant, tastefully furnished and all equipped with every comfort. Doppia da 199 Euro. Villa Poggio ai Merli, via di Giogoli 5. ☎ +39 055 250257 (fax +39 055 250718). A fashionable historic Florence residence located between Florence and the Tuscan countryside. Completely renovated in 2003. Suite rooms from €230. Hotel Unicorno, via dei Fossi, 27  ☎ +39 055 287313 (fax +39 055 268332). Small 3 star hotel in the historic centre near Santa Maria Novella railway station. Renovated in 2011, double rooms from €80. Hotel Select Executive, Via G. Galliano 13/a,  ☎ +39 055 330342 (fax +39 055 351506). 4 star hotel near the historic centre. Double rooms from €100. Free WiFi is available at most restaurants, cafes, and bars. Florence Magazine is a free Anglo-French quarterly publication available in Florence. This magazine was created by expatriates living in Florence to guide, inform and entertain English or French speaking people discovering Florence. Florence is generally safe, but take precautions against the opportunistic thieves common to major tourist attractions: pickpockets and purse snatchers. Savvy thieves congregate in crowds, lot of the operating around Santa Maria Novella train station. If you have a pocketbook with a classy, noiseless zipper, it will be opened. Passers-by pay little attention and don't attempt to stop the running thief even if you shout loudly. Also exercise caution on buses: pickpockets can be active on crowded ones and, as everywhere else, they preferably target tourists. Occasionally, some types of beggars can be insistent and distracting while at the same time another thief quietly steals your wallet or phone. Again, this is nothing new to major tourist spots. Beware of Stendhal syndrome, also known as hyperkulturemia, namely, dizziness caused by being overwhelmed by Florence's fantastic art. Yes, it's a real syndrome, named after 19th-century French author Stendhal, who suffered from it during his stay in Florence. If you get overwhelmed, rest your eyes and legs, get some food (remember gelato), and save the rest of Florence for tomorrow. Florence is a great starting point and base for a tour of Tuscany. Attractive day trips include Pisa, Lucca, San Gimignano, Arezzo, Fiesole, Lucignano, Siena, and of course the wine zone of Chianti. Greve in Chianti is the market town of the Chianti zone and it is in the hills surrounding Greve that you can rent a B&B room or a small apartment on a working vineyard for less than a hotel in Florence. The SITA Pullman buses take you to Greve and Panzano in about an hour. From then on you see few cars and many cypress and olive trees. The SITA bus station is just west of the train station in Florence. This is where to go to catch a bus to Siena, San Gimignano, and so on. If you're at the roundabout, facing the train station, go 90 degrees left and stay on the left until just past the fork. You will see the entrance to the SITA garage on your right. If you are to visit one place in Florence, it has to be the Piazzale Michelangelo. It offers an amazing view of the city. There is a lovely walking trail and even a large church, San Miniato, at the top of the mountain. It is a must see. Fiesole is in the hills above Florence, only a short bus ride away from the center. It offers a beautiful view of the sunset, and a small museum located on ancient Roman and Etruscan ruins of a temple and an ampitheater. World War II Florence American Cemetery and Memorial: 12 km (7.5 miles) south of Florence on the west side of Via Cassia. The Rome-Milan highway passes near the cemetery. Open daily except for 25 December and 1 January; 9AM-5PM. The cemetery is the final resting place for 4,402 American military dead lost during after the capture of Rome and the battle for the Apennines. A monument is inscribed with the names of 1,409 Americans whose remains were never found or identified. The atrium of the chapel contains marble maps of World War II Italy campaign. 20 min bus ride from the Sita Station, just ask agent (get a return ticket). Free to enter. Biking options outside of the city include the Chianti area, where you can fully enjoy the hills and the elegance of the landscape surrounding you, which has been taken care of endlessly through centuries. Strong scents can be enjoyed in Spring. The warm temperatures and usually stable weather in the good seasons can make the ride even more enjoyable. If you feel more energetic, ascents to Vallombrosa from Pontassieve through Tosi can be very enjoyable. You start from the Arno river plain and you end up in a thick, shady, fresh forest. In all cases, avoid the hottest hours in Summer and be aware of the traffic, which can be heavy and not cyclist-savvy, until you get in secondary or less populated roads. This is a usable article. It has information for getting in as well as some complete entries for restaurants and hotels. An adventurous person could use this article, but please plunge forward and help it grow! This page was last edited on 14 April 2019, at 08:35.